We all go through moments of anguish and anxiety, which makes us have a temperament more difficult to be addressed by those around us, whether they are family, friends or co-workers. In this way, without the peace of mind and the precious psalms of the day we begin to develop difficulties to sleep, low immunity and, as a consequence, we become more susceptible to illness, failing to enjoy life and bringing a more difficult conviviality to all. Next we will look at the meaning and interpretation of Psalm 74. 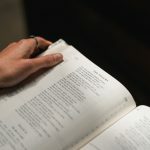 Known as the heart of the Old Testament, the book of Psalms is the largest of the entire Holy Bible and the first to clearly cite the reign of Christ as well as the events of the Last Judgment. Based on rhythmic statements, each of the Psalms has a purpose for every moment of life. There are psalms to heal, to acquire goods, to the family, to get rid of fears and phobias, for protection, to succeed at work, to go well on a trial, among many others. However, the most correct way to chant a psalm is almost to sing, thus obtaining the desired result. Healing resources for body and soul, the Psalms of the day have the power to reorganize our whole existence. Each Psalm has its power and, in order for it to become even greater, enabling its goals to be fully attained, the chosen Psalm should be recited or sung for 3, 7 or 21 days in a row. Connecting to the divine can certainly bring more encouragement to our hearts and thus reduce anxieties. Several emotional situations can bring us to this problem, whether positive things like a new passion or new challenges at work, or negatives such as fear, phobias and so many others that bring us strong emotional impacts. This anxiety hampers our ability to concentrate and discern the best way out of the problem, which creates even greater levels of this destructive feeling. This is the best time to turn to the psalms of the day, connect with the heavens, and seek the peace of mind needed to clearly see the best solution to the problems. Psalm 74 helps us through the spirit to fight our sorrow, our anxiety and our anguish. The Psalmist calls attention in a timeless way to his people, highlighting very relevant questions of the Christian life. With faith and open heart, chant this Psalm.